Evanston Township High School District 202's eight board candidates answer to concerns about racial inclusion, safety, administrative expenses and curriculum at a public forum held Wednesday night. Voters will choose four to sit on the school board on election day, April 9. 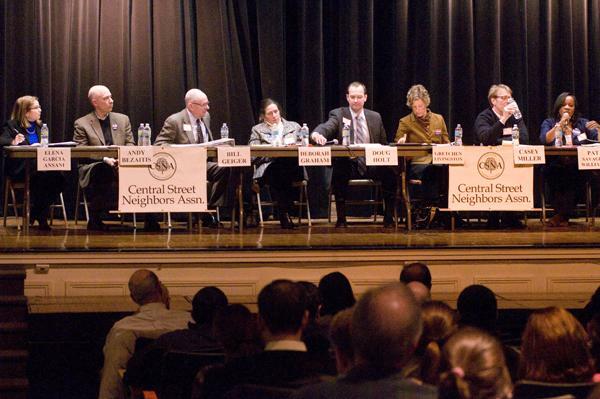 Eight candidates vying for four Evanston Township High School District 202 school board positions clashed over hot topics such as taxes, curriculum, diversity training and consolidation with Evanston/Skokie School District 65 at a public forum Wednesday night. The forum was the first of five scheduled discussions calling for prospective school board members to state their platforms and answer to the public’s most pressing concerns. Wednesday’s discussion at Haven Middle School, 2417 Prairie Ave., was sponsored by Central Street Neighbors Association, which hosted a similar discussion for district and state elections in October. With school election day coming up on April 9, CSNA president Mark Sloane characterized this year’s District 202 race as more contentious than usual, especially considering District 65’s four candidates are all running uncontested. The District 202 ballot consists of incumbents Deborah Graham and Gretchen Livingston as well as new candidates Elena Garcia Ansani, Andrew Bezaitis, Bill Geiger, Doug Holt, Casey Miller and Patricia Savage-Williams. Candidates largely agreed on issues such as upholding parents’ right to be involved in school matters and taking more than test scores into consideration when evaluating students. However, they split in other areas. When asked to evaluate ETHS’ consumption of 27 percent of property taxes in the district and whether the board should tax to the max, some candidates said high taxes are an unavoidable reality, while others rejected the notion of increasing taxes. Livingston argued the district relies heavily on local property taxes because state funding has all but dried up in recent years, and the board has been making administrative and personnel cuts despite the high pressure placed on local taxpayers. Holt, on the other hand, said the high school’s budget could always be reconfigured to make operations more cost-efficient. Regarding the issue of potentially extending contracts for diversity consultant Pacific Educational Group, board members were hesitant to take a clear side. PEG has previously drawn ire for what some consider an anti-white slant to its racial equity training in schools. In considering safety at ETHS and street violence in surrounding communities, candidates generally agreed the school could take more precautionary measures but offered varying solutions. Some focused on the need for more security officers and cameras, but others pointed to fixing the root causes of crime – such as cyclical poverty and unemployment – over generations. “Violence has humbled all of us,” Savage-Williams said, observing that although crime rates associated with the neighborhood surrounding ETHS is concerning, the school itself is a safe place for students. She and Livingston stressed the need to turn to the school safety administrator and obtain another school resource officer. Holt agreed that temporary cameras around ETHS should be made permanent, but also suggested analyzing gang activity in the Dempster-Dodge area. Graham underscored that each ETHS student should graduate with skills to gain employment and that the board should strive to ensure career readiness in addition to college readiness. With a roundtable scheduled for Feb. 26, the candidates’ positions will narrow in coming weeks as the race escalates. Early voting starts March 25.